French president Macron, his rating recently tumbling to a new post-election low, went into the summer break rolled by a scandal over a rogue aide and returned to a string of bad news on the economy and his reform agenda. But the biggest blow emerged out of the blue on Tuesday when his star minister for energy and the environment, Nicolas Hulot, the most popular member of Macron’s cabinet, announced he is stepping down during a live interview, citing frustration with a lack of progress on green issues. 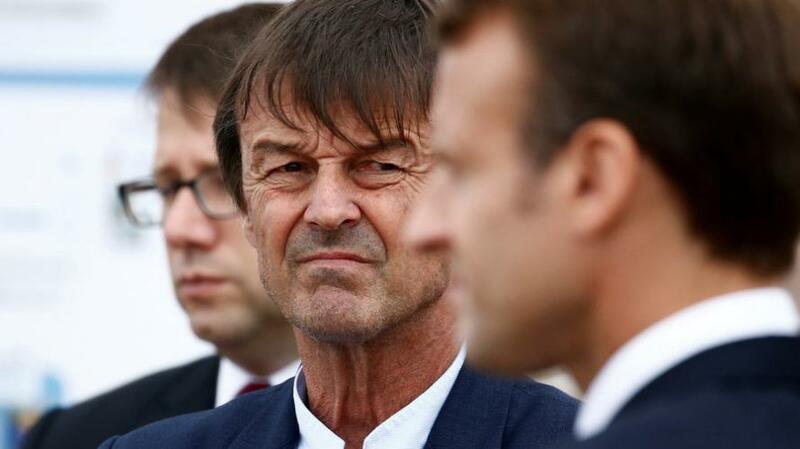 Hulot, 63, a TV celebrity and veteran environmental activist, joined Macron’s government in May last year and has since struggled to fit in with other members of the cabinet and its general policies. Speaking to France Inter radio on Tuesday morning, he said last night he decided to resign, citing an “accumulation of disappointments” with the government’s failure to stand up to lobbying and give a priority to climate change, threats to biodiversity and other environmental issues that urgently needed to be addressed. The former minister specifically blamed the lack of action to protect the environment against pesticides or land destruction and in sheltering biodiversity, among other causes he sought to promote. Hulot, a vocal environmentalist for decades who made television programs about nature, was one of Macron’s most prominent ministers. He said he hadn’t notified the president or the prime minister ahead of his radio announcement; he added that Macron had his respect and friendship, but the decision to step down was up to him. While not the first minister to quit, Hulot’s critique is particularly cutting for Macron, who came to power last year saying that his election was the embodiment of France’s transformation, even revolution. One day after a foreign-policy speech loaded with grand ambitions, the resignation is a reminder that Macron’s presidency hinges on the success or failure of his domestic program. "It takes time to change things in a country and Macron knows it, but what we see now is a climate, a change of mood in France over his actions,” said Bernard Sananes, who heads Paris- based polling institute Elabe. “He’s facing severe headwinds." As Bloomberg notes, the 40-year-old leader, known internationally for his pro-active, reform-focused agenda, is running into obstacles at home as he prepares for a fresh wave of economic overhauls, from taxes to social benefits, that threatens to alienate even more voters. His government has warned that the economy won’t grow as fast as planned this year and next -- closer to 1.7 percent than the 2 percent targeted -- making any new budget cuts even more difficult for the French to swallow. Responding to the news, government spokesman Benjamin Griveaux said the decision was regrettable, but that the government would recover: "I don’t understand why he is stepping down when we had many successes in the first year that are to his credit," Griveaux told BFM Television. "He didn’t win all his battles but that’s the way it goes for ministers." The resignation comes as Macron struggles to push his approval rating up amid slowing economic growth and in the wake of a political scandal over his security aide, who was filmed beating protesters. Meanwhile, the French pains that got Macron elected, remain: stubbornly high unemployment and an economic expansion that lags that of France’s European peers are rubbing away the sheen of Macron’s 2017 victory. Over the past eight months his approval rating fell 18% points to 34%, his lowest according to pollster Ifop. A majority of French believe his policies are disappointing and see his actions as negative for the country, according to Elabe. Overhauling France is a “systemic” project “and it’s normal that it takes some time,” Labor Minister Muriel Penicaud said Tuesday on Europe 1 radio, shortly before Hulot announced his surprise resignation on another network. Penicaud agreed that unemployment wasn’t falling fast enough despite the labor-law reforms and the company stimulus she and her colleagues launched in the past 15 months. “It’s long-haul work,” she said. Unemployment still hovers above 9 percent and has dipped by just 0.3 percentage points since Macron took power, despite a series of measures to make the job market more flexible and to tighten control over benefits. What’s more, negative sentiment is still fresh over a video released by Le Monde newspaper showing his private bodyguard beating demonstrators at a May Day protest. Macron and his staff covered up the incident for weeks and later defended Alexandre Benalla before being forced to fire him in July. For political opponent and France Unbowed party lawmaker Adrien Quatennens, the addition of Hulot’s resignation is a signal that “the whole Macron system is dislocating,” he said on BFM Television.